Freewaves and Kaleidoscope of Pacific Standard Time announce the Los Angeles presentation of RE:COMPOSITION, a thematic program of four new performances dedicated to the liberating spirit of California-native John Cage’s centenary in 2012. :: January 27-28, 2012; 8:00 pm :: Southern California Institute of Architecture (SciArc), 960 E. 3rd Street + Parking Lot: 350 Merrick Street between Traction and 4th, Los Angeles, CA + live stream via http://dublab.com. Conceived and produced by independent curator Julie Lazar, RE:COMPOSITION considers how current compositional practices are enabling artists in a variety of disciplines to re-conceive or reconstitute aspects of their art production. 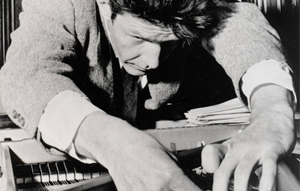 Though no John Cage compositions will be performed during RE:COMPOSITION, the program honors the pioneering role which Cage played in the expansion of visual art and musical compositional practices both internationally and in California during the 20th Century. The new and adapted artworks presented in RE:COMPOSITION are in direct conversation with the work of earlier artists — ranging from Cage to Nan Hoover, and to Oskar Fischinger — as a both a tribute to their legacy and as a point of departure for the younger artists’ evolving creations. RE:COMPOSITION, which debuts at San Francisco’s Southern Exposure on January 20-21, is the only project in the Getty Foundation’s Pacific Standard Time initiative which features state-wide commissioned performances that is traveling between San Francisco and Los Angeles, a journey which references the flow of artistic ideas that have historically moved up and down the coast. Complete video documentation will be posted at http://www.k-pst.org on February 29. Still Movement: Homage to Nan Hoover (2012) by Sandro Dukic. A commissioned performance installation inspired by Hoover’s photographic work from 1980. The title describes the occupation of her interests while the event manifests the contours of her core ideas. A video installation by Nan Hoover is also on view in Exchange and Evolution at the Long Beach Museum of Art (ends February 12). Bar Hopping (2012) is composed and performed by Joan Jeanrenaud and Paul de Jong. Commissioned music and film that playfully rethinks visual and musical influences in California from the mid-1950s to the present including cello concertos and contemporary experimental composers. This is a remote collaboration between two leading artists residing on both coasts of the U.S.
Evolution (2010-12) by JD Beltran with music by Marc Barrite and technical assistance by Scott Minneman. As an adaptation of AntiMaster, projected digital film is synchronized with live electronic music.. Evolution is inspired by the migration of ideas between San Francisco and Los Angeles from the late 1940s through the 1960s that formed the basis of the Visual Music Movement. Its creative influences include Oskar Fischinger, James and John Whitney, Jordan Belson and Harry Jacobs. I N T E R R U P T U S (2009-2012) by Joan Retallack and Michael Ives. A procedural lecture for two voices in homage to John Cage’s principle of interpenetraton and non-obstruction. Performed by Michael Ives and Joan Retallack who collaborated on a unique realization of the piece. K-PST highlights ideas that shape California’s fertile contemporary art landscape through performances and an online source for artworks, interviews and programs by artists and curators from 1945 to the present. RE:COMPOSITION, a K-PST production, inaugurates a series of diverse new artworks to be performed state-wide including at Southern California Institute of Architecture (SciArc) on January 27 and 28th at 8 pm. The website and commissions were made possible by The Getty Foundation, LA>< ART, Wanda Kownacki and John Holton, Joan and Fred Nicholas, Ministarstvo Kulture Republike Hrvatske, CEC ArtsLink, and Sasha and William Anawalt. In-kind services and donations are provided by Montalvo Arts Center, Southern California Institute of Architecture, Southern Exposure, Freewaves, Japanese Cultural and Community Center, EPSON, Miyaho Hotel and Anawalt Lumber. ABOUT THE PARTICIPATING ARTISTS & CURATOR: Marc Barrite created the DJ/production alias Dave Aju as a vehicle for his fresh and expressive take on electronic music. Combining a natural sonic fascination and adventurous approach with a broad palette of musical influences, Dave Aju’s remixes, DJ sets, and live performances are constantly in demand at labels, venues, and festivals across the globe. His debut full-length album Open Wide is still heavily praised by both everyday music-lovers and esteemed colleagues for it’s bold diversity of styles and the conceptual yet effective use of only his mouth and voice as sound sources. Dave Aju currently resides in San Francisco and continues to develop original solo works as well as several new international collaborative ventures. John Cage (born September 5, 1912, Los Angeles, California, U.S.—died August 12, 1992, New York, New York) was an American avant-garde composer whose inventive compositions and ideas profoundly influenced mid-20th-century music and visual art. Cage briefly attended Pomona College and then traveled in Europe for a time. Returning to the United States in 1931, he studied music with Richard Buhlig, Arnold Schoenberg, Adolph Weiss, and Henry Cowell. While teaching in Seattle (1936–38), he began organizing percussion ensembles and experimenting with works for dance in collaboration with his longtime partner, the choreographer and dancer Merce Cunningham. Cage’s early compositions were written in the 12-tone method, but by 1939 he had begun to experiment with unorthodox instruments such as the “prepared piano” (a piano modified by objects placed between its strings in order to produce percussive and otherworldly sound effects). Cage also experimented with tape recorders, record players, and radios in his effort to step outside the bounds of conventional Western music. Later, Cage turned to Zen Buddhism and other Eastern philosophies and concluded that all the activities that make up music must be seen as part of a single natural process. He came to regard all kinds of sounds as musical, and he encouraged audiences to take note of all sonic phenomena, rather than only those elements selected by a composer. To this end he cultivated the principle of indeterminism in his music. He used a number of devices to ensure randomness and thus eliminate any element of personal taste on the part of the performer: unspecified instruments and numbers of performers, freedom of duration of sounds and entire pieces, inexact notation, and sequences of events determined by random means such as by consultation with the Chinese Yijing (I Ching). In his later works he extended these freedoms over other media. Among Cage’s best-known works are 4:33 (1952), a piece in which the performer or performers remain utterly silent onstage for that amount of time; Imaginary Landscape No. 4 (1951), for 12 randomly tuned radios, 24 performers, and conductor; the Sonatas and Interludes (1946–48) for prepared piano; Fontana Mix (1958), a piece based on a series of programmed transparent cards that, when superimposed, give a graph for the random selection of electronic sounds; Cheap Imitation (1969), an “impression” of the music of Erik Satie; and Roaratorio (1979), an electronic composition utilizing thousands of words found in James Joyce’s novel Finnegans Wake. In 1992, Cage collaborated with Julie Lazar on creating Rolywholyover A Circus, a visual and multi-media composition, for The Museum of Contemporary Art, Los Angeles. Source: 1994-2011 Encyclopædia Britannica, Inc. and J.L. Sandro Ðuki was born in 1964 and lives in Zagreb, Croatia. His works – spatial, architectonic and photographic installations and constructed films – move from one medium to another with ease. He studied with Nam June Paik and Nan Hoover at the Art Academy in Dusseldorf, and, under Hoover’s mentorship and guidance, has performed or assisted in a number of her artworks. Ðuki has exhibited in Slovenia, Germany, the US, Italy, Serbia, Austria and Croatia. In 1991 he received the Croatian Artist Association Award. Michael Ives is a writer and musician whose poetry and fiction has appeared in numerous journals in the United States and abroad. He is the author of The External Combustion Engine, a collection of short prose. The language /performance trio, F’loom, which he cofounded, was featured on National Public Radio, on the CBC, and in several international anthologies of sound poetry. He has taught at Bard College since 2003. Joan Jeanrenaud, Cellist and Composer, has been involved in music for over 40 years. Growing up in Memphis Tennessee she was exposed to the sounds of the blues, Elvis, soul and classical music. She learned to play her instrument from cellists Peter Spurbeck, Fritz Magg and Pierre Fournier, studied jazz with David Baker, Joe Henderson and Hal Stein, worked with Kronos Quartet as cellist for 20 years and now for the past 12 years has been involved with solo and collaborative projects in composition, improvisation, electronics, and multi-disciplinary performance. She has completed more than 50 compositions for cello and small ensembles many of these multi-media works. Recent projects include her installation work ‘ARIA’ with collaborator Alessandro Moruzzi, premiered at San Francisco’s Yerba Buena Center for the Arts, and the composition and performance of ‘ODD’ with choreographer Shinichi Iova-Koga and the AXIS dance company. Her CD, ‘Strange Toys’, released on the Talking House label in 2008 was nominated for a Grammy, and her most recent release, ‘Pop-Pop’, appears on her new record label Deconet Records. Go to www.deconetrecords.com and www.jjcello.org for more information. Julie Lazar directs International Contemporary Arts Network, a San Francisco-based curatorial and arts consultancy firm. She served as founding Curator and Director of Experimental Programs at The Museum of Contemporary Art, Los Angeles; Guest Curator at Montalvo Arts Center; and Adjunct Professor at the San Francisco Art Institute. In New York, Lazar led development programs at The Museum of Modern Art, Rockefeller University, The Hudson River Museum, and PS 1 Institute for Art and Urban Resources. Paul de Jong. Born into a musical family, Paul began studying the cello seriously at the ripe age of five. He took a razorblade to his first audiocassette at age fifteen, moving quickly through feverish periods of teenage experimental band life and absurdist theatre. Concertizing classical repertoire and composing instrumental and electronic music for dance companies through his early thirties. After receiving music degrees in his native Netherlands and having studied at the University of Illinois, he moved to New York City in 1993 to briefly study at the Manhattan School of Music, teaching cello, assisting nonagenarian electronic music pioneer Otto Luening, and becoming the other half of The Books. De Jong is exploring new collaborations, creating music, poetry, and prints in New Lebanon, New York. Joan Retallack is an American poet, critic, biographer, and multi-disciplinary scholar who has authored seven books, including Circumstantial Evidence (1985), Icarus FFFFFalling (1994), A F T E R R I M A G E S (1995), Lannan Foundation for poetry and the National Endowment for the Arts. Retallack currently teaches poetry and poetics and Memnoir (2004). Her awards include an American Award in Belles-Lettres, a Pushcart Prize, and grants from the as the John D. and Catherine T. MacArthur Professor of Humanities at Bard College, where she is a director of the Language and Thinking program.